Lighting your garden can provide a soft, even glow throughout the entire yard after dark, but it also play up those features that you want to show off. With the ideal lighting arrangement, your garden can stand out while you are sitting on the deck looking out across the yard at night. 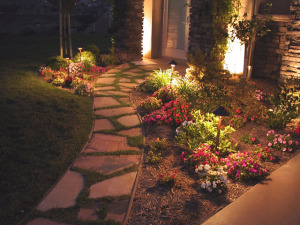 Landscape lighting placed in garden beds in your front yard will really make your home stand out as people drive by. A beautiful garden can be enjoyed not just during the daytime with the right lighting. If you’re used to spending time in your yard when the sun goes down, why not add some lighting that not only will make it more attractive but also create an inviting atmosphere. And landscape lighting is a more pleasant way to make your yard safer – it’s much easier on the eyes than harsh flood lights. When you choose to install landscape lighting, you’ve got lots of options. If you’re looking for something that won’t require in-ground installation of electric cable, consider solar lighting. Solar lighting is relatively inexpensive, and it’s also an eco-friendly choice. One interesting type of solar lighting is the lighted solar fountain. Solar fountains like the one in this photo are a fun way to get more use out of your yard. You can have that soft water sound day or night, and after dark the built-in lighting highlights the water flow. But you don’t need to worry about your utility bills because it runs on solar power. 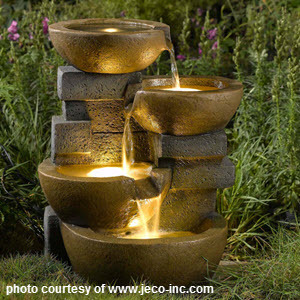 Lighted solar fountains come in many different styles too, so you can match the look and feel of your home and garden. Solar lighting is popular with many homeowners because it doesn’t cost anything to have the lights on at night. You can use them down pathways, to mark places throughout your garden or use them around the deck. They are beautiful and add a certain quality to the yard that wouldn’t be achieved with much brighter, more expensive types of lighting. Remember, solar lighting may not be ideal for those shady areas that might not get enough sunlight during the day. You may not get enough of a solar charge to keep those lights working during the night. Also, certain brighter lighting might be useful in other areas of the yard. In cases like these, low-voltage landscape lighting may be better. When you want to place beautiful lighting around you yard, down your walkway or even throughout your garden, we can help. We install low-voltage landscape lighting, but we can also help you if you’ve got other lighting needs. Here at Architectural Landscape Design, we can implement the best look and feel for your yard. We are a licensed Minnesota landscape company that you can trust. We are currently scheduling free initial in-home design consultations. Why not give us a call to speak with us more regarding the beautiful outdoor lighting you’re in need of!